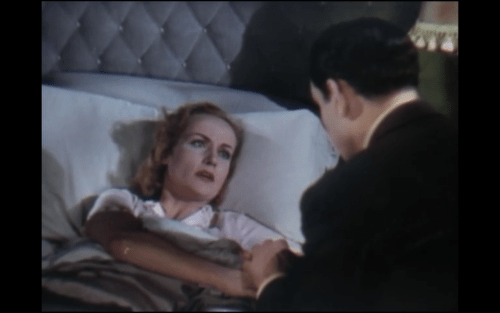 Nothing Sacred is a late 1930s comedy starring Carole Lombard and Fredric March. Carole is Hazel Flagg, a woman who thought she was dying of radium poisoning when suddenly she finds out that it was a misdiagnosis. Her plans for travel and adventure in her ‘last days’ are shattered, until New York newspaper man Wally Cook (Fredric March) enters the picture. Hazel uses her misdiagnosis to her advantage, convincing Wally that it’s the perfect story for his paper in hopes that he can provide her with the adventure she still wants. The film is a satire of many things – life, death, our perceptions of what the human experience is about, the state of Vermont and its residents and – of course – the media. No character or scenario is left covered; the faults and missteps of every character are portrayed openly. We’ve all seen these characters before in our own lives – the manipulative person who takes advantage of their hardships; the pushy over-achiever; the person who is over-protective to the point of becoming stone-cold and closed off. And for that reason the portion of the satire that pokes fun at life itself is particularly successful. The humor of the film is not over-the-top and doesn’t beg for huge belly laughs from the audience. It’s a bit more subtle, much like the subtle humor of daily life. This is another reason that the film is so effective. Lombard and March are fantastic leads, elevated by a fantastic supporting cast and script. Another thing that really wowed me about this film was the variation and uniqueness of the shots. One shot shows the two main characters conversing, but with their faces covered by a tree branch; another, later shot is almost completely dark, with barely discernible silhouettes of the characters. I can’t think of a single thing I didn’t enjoy about this film. The acting, plot, direction, Technicolor, dialogue and humor are all near-flawless.